A tongue-lip adhesion followed. Dr. Thomas Samson, a plastic surgeon at Penn State Health Milton S. Hershey Medical Center, sutured the undersurface of the tip of Knoxley’s tongue to the inside of his lower lip to hold it in a more forward position. Dr. Samson also anchored the back of Knoxley’s tongue to his jawbone to pull the tongue up out of the airway. Unfortunately, the stitches didn’t hold. Knoxley would have to undergo a mandibular distraction, a surgical procedure to lengthen a small or recessed jaw. “About 80 percent of the kids born with Pierre Robin syndrome don’t need surgical intervention,” said Dr. Cathy Henry, the Milton S. Hershey Medical Center plastic surgeon who performed the procedure. “In those cases, the airway obstruction is relieved with positioning of the baby alone, and overtime the lower jaw catches up to the upper jaw. At that point, the baby outgrows the airway obstruction.” Knoxley was one of the babies for whom positioning did not work. To lengthen Knoxley’s jawbone, Henry cut it and inserted distraction devices. Twice a day, pins attached to the distraction devices were turned, gradually pulling the two ends of the bone apart and allowing new bone to form between the two ends. The team turned the pins for about one week, and Knoxley’s jaw lengthened. On Feb. 1, 45 days after he was born, Knoxley came home. Knoxley continues to make progress, Himes said. 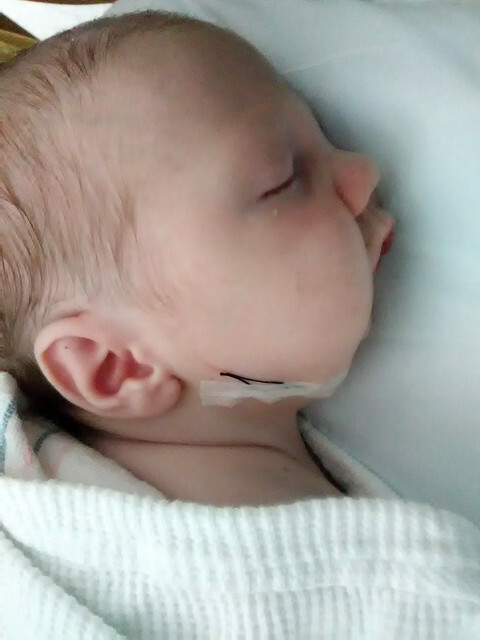 Within two weeks of being home, he didn’t need a feeding tube and was able to take a bottle. His next surgery to remove the distraction devices is scheduled for April 2. “The new bone is essentially scar tissue that has to harden,” Henry said. Doctors plan to repair Knoxley’s cleft palate when he is between 12 and 18 months. The team includes a plastic surgeon, orthodontist, pediatrician, pediatric dentist, speech pathologist, feeding specialist, social worker, ear, nose and throat doctor and audiologist. Knoxley went home 45 days after he was born. Entry filed under: Features. Tags: cleft palate, Lancaster Cleft Palate Clinic, Penn State Children's Hospital, Pierre Robin syndrome, plastic surgery. My jaw dropped at the following quote from Dr. Kaiser: “The child goes from having a very narrow chin to looking quite handsome or pretty.” Please, please rethink speaking like this. Kids with PRS can read, you know! And, as a mom of a daughter with PRS, I know that surgery is not necessary for a child with PRS to be handsome or pretty. Hello! We greatly appreciate your comment. I contacted Dr. Kaiser, and he would like to thank you as well. He said, “I agree, surgery is not necessary for a child with PRS to be pretty or handsome.” He asked me to change his quote, which I did.